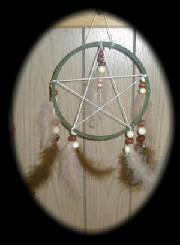 It is believed that hanging a dream catcher over a person while they sleep will protest them form harmfull dreams. the harmfull dreams are traped within the web of the dream catcher while the good dreams or visions trickle down through the feather into the person while they sleep, and the harmfull dreams are destroyed at dawns first light. below is a poem I've written about dream catchers. Fall asleep little girl, don't be afraid of the night. For your dreams will unfurl, The man in the moon, he don't bite. To protect you from nightmares, I will hang a magic charm. It has the strength of a bear, and no loud alarm. Its maid out of love, and its web woven beads. Its pure like a dove, it protects all your needs. Its an Indian dream catcher, maid by our hands. Its the nightmare snatcher, and allows good dreams to stand.